Boarded-up windows, manure on the driveway and a tractor in the dining room are not typical welcome-home gifts for a couple returning from their honeymoon. But that’s exactly what greeted newlyweds Dave and Lianne Roe, after their friends “decorated” their Bamber Bridge home while they were away. The pair returned from a week away in Mallorca to discover a bath full of balloons, roadworks outside and their cutlery individually wrapped in cling film. The pranks have become a tradition among the couple’s friendship group, beginning in 2008, and getting more extreme each time. 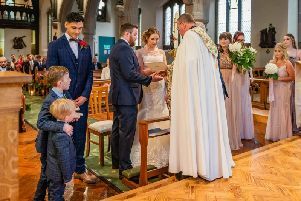 Dave, 31, and Lianne, 30, were married at Our Lady and St Patrick’s Church in Walton-le-Dale, with a reception at Beeston Manor in Hoghton. Dave, a farmer, said: “I was fully expecting it - it was revenge. When Chris got married I wrapped his house in bale wrap and made it look like a bale - his cars, his hedge, his gates, so I was expecting it. Lianne saw the funny side. He said the only person who “escaped” the prank was the couple’s one-year-old daughter, Jessica, whose belongings were left alone. Dave said: “They had boarded the windows up, they had put a three-piece bathroom suite in the porch - a bath, a sink and a toilet. “They filled all the drawers with rice, they took all the labels off the food tins so we don’t know what they are. “They filled the sugar pot up with salt, and filled all the pillows with rice. “They put signs in the top window saying ‘beware of the bull’, and they put a sold sign in front of the house. “There were some road work signs in the middle of the drive, and with my pick-up truck, they wired the foot brake up with the horn, so every time I touched the brake it sounded the horn. Dave said he had put the house back to normal but was still discovering tricks they had played.